The distance children growing up in Britain today roam, independently from their home, is on average 90% less than in the 1970s. This means less freedom, less opportunity to learn to assess risks and make decisions, and less responsibility; which in turn means less opportunity to become responsible. It means less chance to get to know their community, and find their place in it, less chance to connect face to face with other people and less chance to create a meaningful relationship with the nature outside of themselves. In a 2014 survey of 1000 parents, half said they don’t let their children play outside because of safety concerns, and 26% said their children spend less than 30 minutes a week playing outside. So is this increase in captivity because the world outside our doors has become more dangerous for children than in previous generations? It is true there is significantly higher levels of traffic on the roads than in the 1970s, but as for ‘stranger danger’, there’s no statistical reason for parents to be more worried now than when they or their grandparents grew up. One of the reasons for this increase in fear, is a reduction in social trust—whether people think that most other people are generally honest, reliable and safe. Social trust figures have been falling in the UK, particularly amongst the younger generations, which could be a reflection of the fact that young people interact less with their community now than in previous generations. Society’s fear that the world outside is harmful to children is causing harm to childhood itself by raising a generation of children who don’t play outdoors. And despite common arguments that today’s children only want to stay inside and play video games, UNICEF’s survey of childhood wellbeing found that when asked ‘what makes a good day?’, children overwhelmingly state time playing outdoors as one of the main factors. Forest Schools and woodland play schemes are one way Britain is tackling this lack of outdoor play. Forest School is an opportunity for children to experience nature as a place to explore, play and learn, where they can freely choose what they do based on their own curiosity and motivations, and take appropriate risks, such as using tools or working with fire. 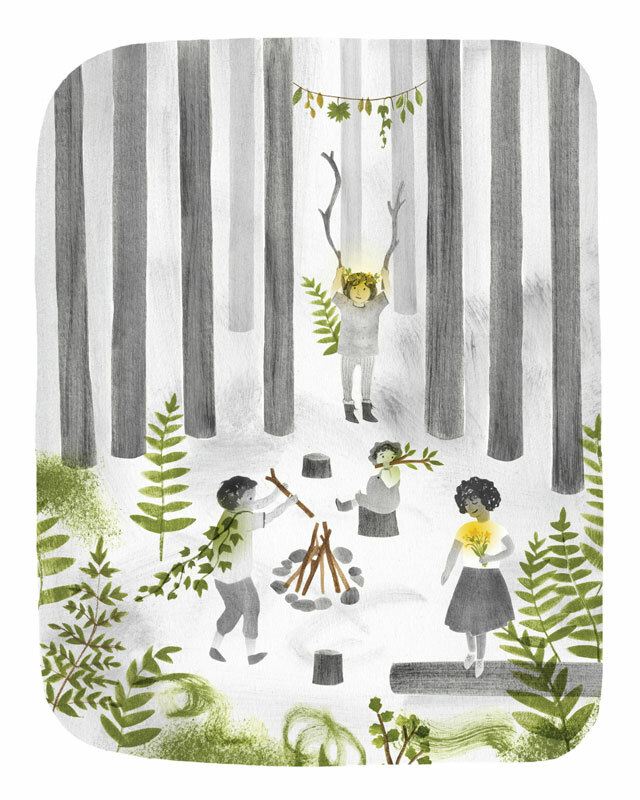 The Forest School movement in the UK has its roots in Scandinavia. The concept was brought back to the UK in the 1990s after a group of nursery staff visited Forest Kindergartens in Denmark and saw how independent, resilient and happy the children were, spending all day in the forest. There are now estimated to be over 12,000 trained forest school leaders in the UK, providing woodland experiences for everyone from babies to elders, with most of the work being done with nursery and primary school aged children. The recorded benefits are vast and wide ranging; research in Germany shows children who attend outdoor pre-schools have been found to enter school with higher than average levels of concentration, communication and social skills, they are better able to make constructive contributions and ask questions and they show more interest and motivation towards learning. In addition to this are the physical benefits; they experience fewer injuries because they are better able to asses risks and are stronger and have better balance and coordination, and are ill less often, having developed a stronger immune system than children who spend their pre-school years indoors. They also learn maths, reading and writing quicker because of their confident attitude, and because they are willing and ready to learn. And importantly, children who spend time in nature, generally turn out to be adults who have a meaningful and caring connection with the world around them, which is to be encouraged if our species is to continue. Obviously the level of benefits differ significantly between children participating in a forest school session once a week, and those attending an outdoor nursery full time as the Danish forest kindergarten children do. Full time outdoor nurseries are starting to spring up throughout the UK, with the highest concentration in Scotland. Although there is an adult present, the forest school leader’s role is to facilitate—to be ‘on tap’ rather than ‘on top’. I see forest school programmes as a stepping-stone towards the independent wild play in nature that previous generations enjoyed without adults watching over them. Trust between the leader and children is an important part of Forest School, as the children have high levels of responsibility for taking care of themselves, each other and their environment whilst engaging in activities that are potentially risky. It’s amazing to see how even very young children can rise to take on the responsibility when they are trusted to do so. In the UK we typically think of boarding schools as being exclusively for wealthy people, but in Denmark, the state pays 75% of the cost of the Efterskole, so those who attend come from all walks of life. During a recent study trip to Scandinavia, it became apparent that the trust which forms an important role in Forest School permeates Scandinavian culture. After noticing many examples of trust in everyday life, I learnt that social trust is statistically highest in Scandinavian countries. Denmark is at the top of the table; social trust has been called Denmark’s biggest asset, the secret ingredient to its ecological and economic success. It’s no coincidence that the countries with the highest levels of social trust also top happiness indices. I was interested to find out about other ways trust manifests in education and provision for young people in Scandinavia. The Forest Kindergartens in Scandinavia are an embodiment of this asset, trust. Firstly, pre-school teachers are trusted by the government, management staff and parents to make their own decisions about how to look after the children. There is no extra qualification required to take the children to the forest above that which is required of indoor pre-school teachers. Teachers are using their own creativity, passion and initiative rather than following a rulebook. There are no observations either by management staff, or any external body like OFSTED. There’s no such thing as a written risk assessment; teachers don’t need to prove to anyone that they have thought about the wellbeing of the children, they are just trusted to do so. As trust researcher Gert Tinggard Svendsen says in his book on the subject, “Trust is futile if everything is controlled and people are treated as if they cannot be trusted”. This trust extends to the children, who are given high levels of freedom and responsibility. It’s not unusual to see four year olds independently sawing or using knives to work on their own projects. There will always be a teacher close by, ready to help if the child needs it, but not hovering around or interfering in the work of the child unless their help is called for. Another example of the trust that pervades Danish culture is the attitude towards young people and teenagers, which is one of respect, where trust and responsibility given, lead to trustworthy and responsible young people. For example, Danish teenagers have the opportunity to attend an Efterskole for a year when they are 15. An Efterskole is a boarding school, where the focus is on the personal development of the students, teaching them “enlightenment for life, general education and democratic citizenship.” The young students have the chance to develop social skills and independence, focus on their unique talents, passions and gifts, and have the space and time to work out who they really are. At the same time they follow the standard curriculum subjects for their year group, but they are given a strong message that pursuing their dreams and passions is just as important as their academic achievements. There are Efterskoles that specialise in singing, dancing, art, agriculture and a whole host of other things, so students choose from the 250 Efterskoles across Denmark, based on their interests. The students live together with their teachers, and learn to look after themselves in a supportive environment. In the UK we typically think of boarding schools as being exclusively for wealthy people, but in Denmark, the state pays 75% of the cost of the Efterskole, so those who attend come from all walks of life. The teenage years are an important time for allowing young people to feel trusted, to begin to take decisions for themselves, and form their own identity separate from their parents. Efterskole offers young people the chance to do this, just as rites of passage in indigenous cultures hand over responsibility to the young person, and trust them to take decisions for themselves. What kinds of messages do we give to 15 year olds in the UK about what’s important? The pressure of taking GCSE exams usually takes centre stage, and dreams and interests outside of the academic realm often get pushed aside. By not showing young people they are trusted, we are denying them the opportunity to become responsible. Is it any wonder we end up with disenchanted youth? At Tårnby nature school in Copenhagen, once children have attended an activity session with an instructor, they are invited to return with friends or family and borrow equipment. This might be snorkels and wetsuits, or fire lighting and cooking equipment, GPS units, bikes and even apple pressing equipment. All of this is possible because of trust. There aren’t any booking forms, deposits or credit card details to take, all controls which would make the process more expensive to manage and less viable, as well as giving the borrower the impression they weren’t trusted. Scandinavia has a strong culture of nature connection, and this too can be described as trust; trust in the abundance of the environment, and its ability to nurture and support body, mind and spirit, and in return being responsible guardians of the abundant, generous environment. Perhaps knowing others in your community have equal trust in and respect for the environment and will not unfairly exploit its resources is a cornerstone of the development of social trust. The UK has historically taken a less fair or respectful stance towards access to its land, with the Enclosure Acts of the 18th and 19th Century, where roughly seven million acres of common land was made into legal property for the rich. Land grabs such as this fuel a scarcity mentality and erode social trust—those who have land build walls to deny access and protect their property from those who don’t, leading to mutual distrust. The Enclosure Acts meant most people no longer had free access to land and this excess population were forced into the new factories of the industrial revolution, and their labour on farms was replaced my machinery, meaning the social structures of the community changed as people spent less time working and engaging together outdoors. According to social trust researcher Gert Tinggard Svendsen, a country’s social trust takes a long time to build up, but can be eroded very quickly. So what is being done to slowly rebuild this trust? As well as woodland play schemes and forest schools, CSAs and community managed farms, orchards and woodlands all work to bring people together to connect with each other and the land, in circumstances where people are treated as equals, with fair rights to access land and resources, and where the harvests are shared around. Working together co-operatively is only possible by first building trust, and where the trust is met with trustworthy behaviour, a positive feedback loop or upward spiral of trust is created. What other ways can we re-connect, build trust and witness the abundance in each other and our environment? And what would this trusting society look like as seen through the lens of our own lives and the people and institutions we engage with? Jen Howard is a freelance forest school leader who works with schools and families to facilitate nature connection and outdoor play in North Devon. In 2015 she received a Winston Churchill Memorial Trust scholarship to study outdoor learning in Scandinavia.